I was flattered by that comment and the perception that I was such an expert on the customs of mass, but I also felt some guilt. Except for visits to Saint Anthony’s in Boston during lunch time, I’d been skipping Sunday mass for several years. I’d love to give a good excuse, but the real reason was laziness. But a while back, I resolved to do better. I don’t go to church because of the “Keep Holy the Sabbath” commandment, I go because I need to go. I want to go. And, so far so good, the church hadn’t collapsed when I walked in and the lightning strikes have (so far) missed. And before I continue, I should emphasize that this one isn’t just directed only Catholics, but to everyone — no matter what you believe in or not, it’s comforting to be able to gather as a community and share a common faith, whatever that may be. There is great power and healing in COMMUNITY and FAITH. It’s such an honor to be asked to collect. I always make it a point to say thank you to the little children who put in money, and always make eye contact to let people know that I’m looking at them, not the amount they put in the basket — that’s none of my business. Last week, an older woman sort of gave a me a little smile and she palmed what was obviously some change into the basket. I was honestly reminded of the gospel story of the poor widow who donated a penny because it’s all she had — and how much more of a gift that was. I wish I could have told her that — no matter what you give, that’s wonderful. Father Steve Madden is such a great guy and we are so lucky to have him back in Foxboro as pastor. He didn’t pay me to say that but I’ve long been a fan — he has a way of connecting with the congregation. Father Steve is “one of us,” along for the journey, leading us, yes, and also learning with us along the way. And I still love his sermons. Without exception, when he ends with his signature, “God bless you all,” I always think to myself, “Message received.” He likes plain M&M’s, by the way. Just thought I’d add that for some bonus points. And speaking of Father Steve, I’m grateful he is finally getting another priest and deacon to help! Father Steve has been single-handedly running the parish for some time. 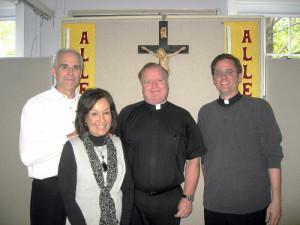 Welcome Father Brian and Deacon Paul! I find that as I get older I find that I appreciate the hymns more and more. Even the most familiar hymns sung as a child seem especially poignant to me these days. I don’t know why, they just are. The choir at the church and singers are, without exception, some of the best I have ever heard. They have incredible talent. I love them. I saw a kid, about 17 years old, texting in church. I was going to say something but I thought to myself, “Shut up, Bobby. He’s IN CHURCH.” When I was 17 I was bored in church too, but I found I learned a lot by osmosis (just being there). Besides, in my day when we were bored in church we didn’t have texting, we made the bulletin into airplanes and choppers. I like how much of a role lay people have in the church these days. Whether it be the passing out the Communion wafer, doing readings, or other aspects of the mass, it seems so appropriate that more and more lay people are involved. We should never forget how lucky we are, that in this nation, we have the freedom to worship (or not) as we choose. I love that the church is usually standing room only every week, not just Christmas and Easter. For my own reasons, my faith has taken a lot of hits this past decade — not to mention the inevitable crisis of faith or two we all get when you’re my age — but the physical act of gathering as a church community and sharing a common faith and receiving such inspiration from a church leader is a gift for which I am forever grateful. You can’t answer your faith questions by staying away. I still have so many questions about life, the universe, and everything. I’ll never have all the answers, but I can find some of them by gathering with the community in church. These days, I’m just feeling grateful that I’m part of a church community that’s so alive and vibrant, a place where I can pray, contemplate, and rejoice. At my age, going to church isn’t an obligation — it’s something I need to do to stay healthy. I still consider myself something of a “Cafeteria Catholic” but being in church very literally nourishes the spirit — it’s like going to the gym — you make all sorts of excuses not to go, but you never regret going. I always feel better after mass. What’s interesting is that at that mass a few weeks back, I just started thinking these thoughts and needed to get them out. And now I have — thanks for reading, and… see you at church!